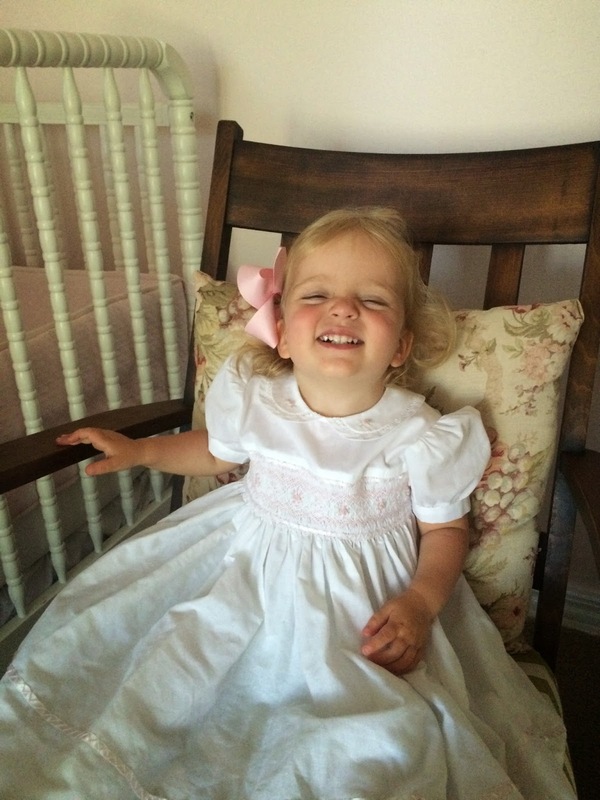 This is a sweet video that captures Hatley-Grace a 22 months right now. Talking all the time, and learning her colors. Usually she is on the go, yet she does sit and focus throughout the day on tasks such as building with her blocks. Enjoy! 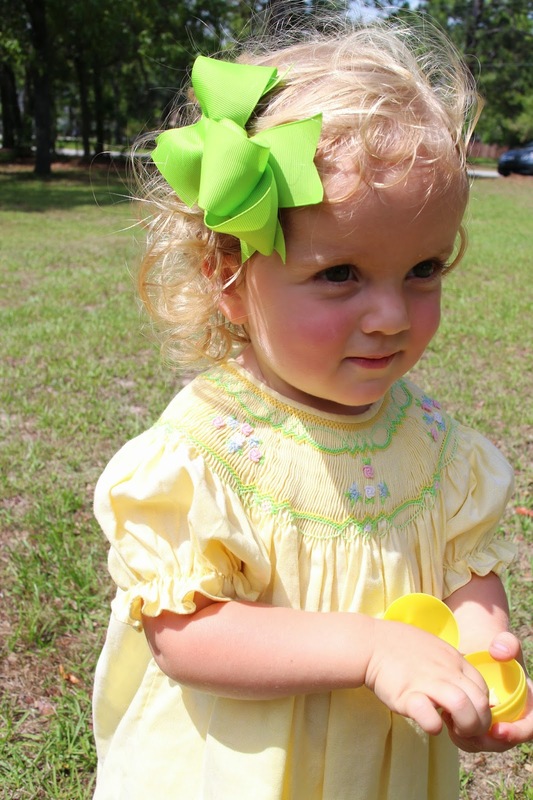 Hatley-Grace is beginning to show a very girly side to her little personality. She has started the high pitch squealing sounds and cute girly giggles. 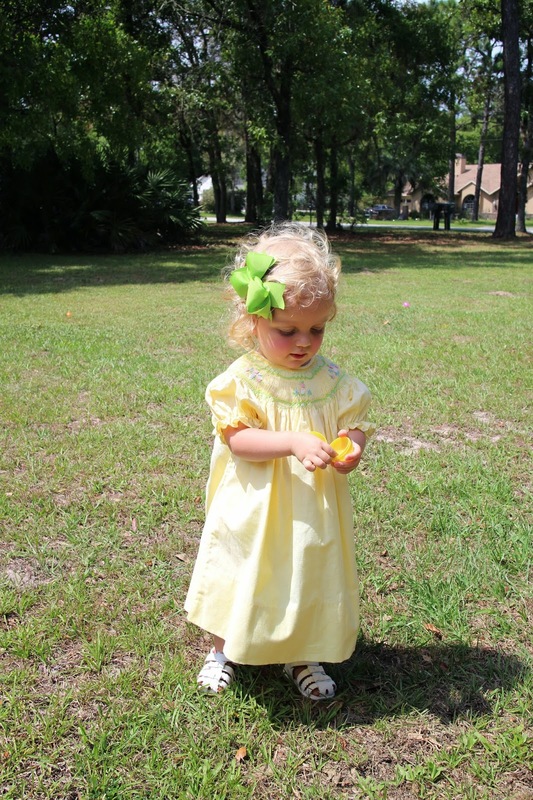 She loves her pretty dresses and asks to wear her egg dress, her Easter dress, all the time. We had high school girls over this weekend to get ready for prom, and she loved their pretty dresses. She pretended to put make up on and do her nails with the girls. 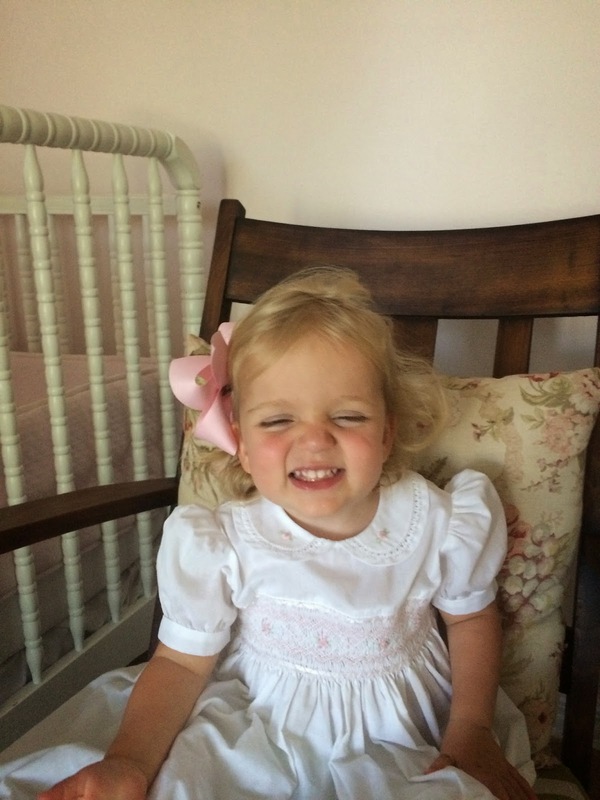 Hatley-Grace does not like to go to bed at night. Nap time is never a battle, she loves to sleep and shouts night night as I leave the room. But in the evening, it is a chore every single night to go to bed. 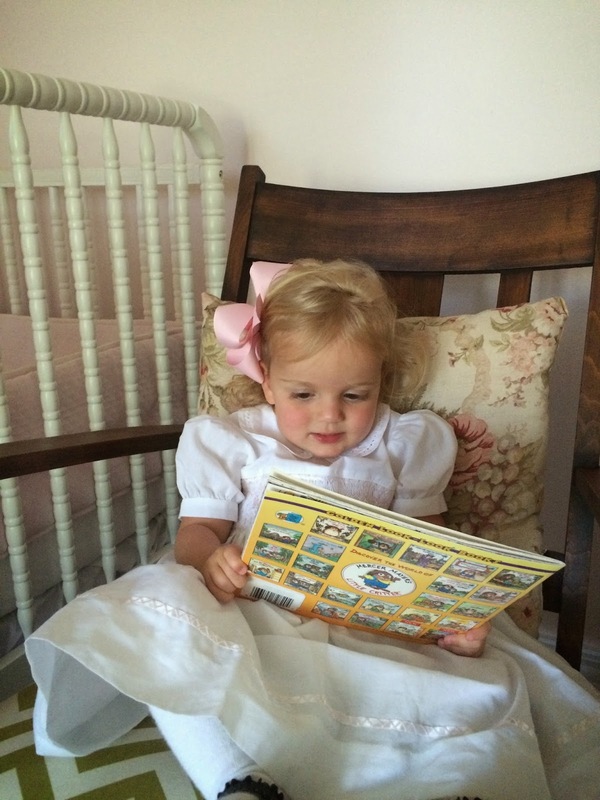 She cries for more books, or water, or poopy, or Mama. She just hates to miss out on anything. I'm hoping this is just a stage. We are outside constantly right now. We bounce between parks, pools, the water table, working in the yard, going on walks, bubbles, sidewalk chalk, etc. Being outdoors is her favorite place to be. You are a busy little toddler, exploring everything around you. You love to push the kitchen chair up to the counter and cook with Mama. You help me make Daddy smoothies in the morning, crack eggs, butter toast and stir cookie dough. After you help, you ask "try it?". You are a big helper right now, and thrive when given a job to do. You like to put trash in the trash can, put your dishes in the dishwasher and put your crocks on. You help me weed the garden beds, and out away laundry and you are so proud of yourself. You have never been a clingy Mama's girl. You are very independent, yet recently I sawyour way of showing me you need some Mama time. This weekend, I hosted a shower at our house. All morning I was busy cooking, cleaning, and visiting with friends. You were content to play with your big friends that were here. When I sat down with the other women to eat, you found your way through the crowded tables to stand next to me and placed your hand on my leg. You didn't say anything, you just stood there for a few minutes touching my leg, and then went back to playing. This was a sweet memory I want to remember from this month that showed me your content personality. You were tired and needed a little recharging from just being near me, and then you were able to be independent for a while longer without me. You are so dear to your daddy and me. You are loved more than you know! 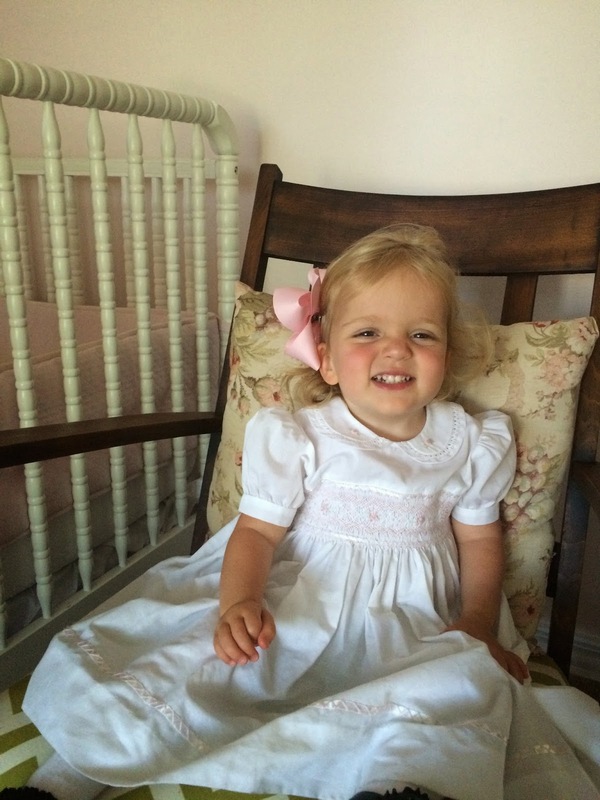 Easter morning, Hatley-Grace enjoyed opening her Easter basket! I think her favorite thing was Minnie Mouse gardening gloves from Mimi. 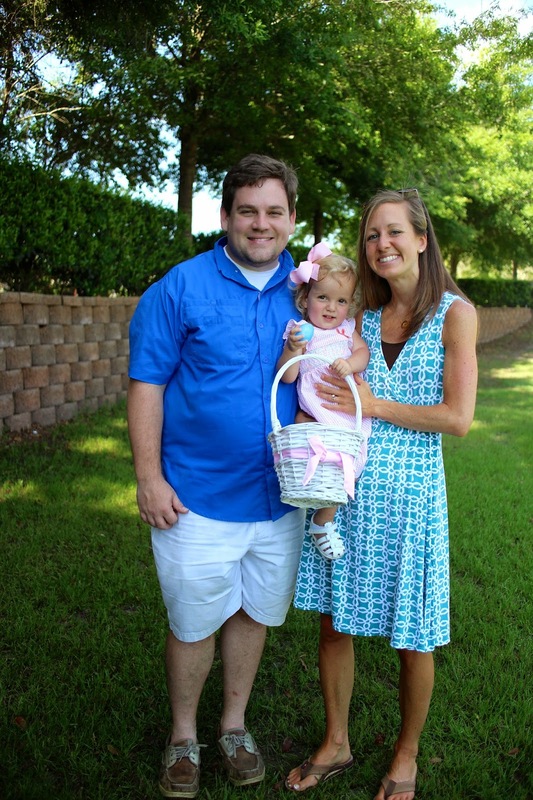 We got dressed and headed to first service to celebrate the risen King! We brought Hatley-Grace into the service for the beginning to listen to the music and to experience us praising the Lord through songs and the liturgy. 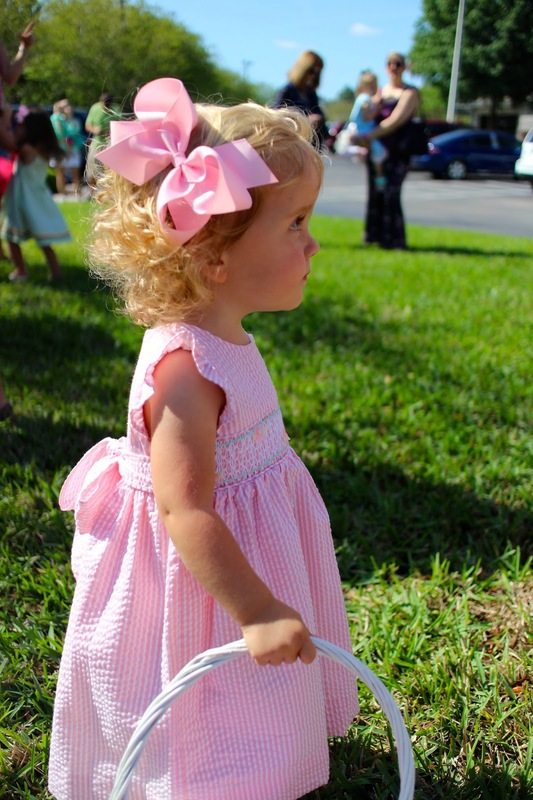 She intently watched the brass as they played, and enjoyed the choir singing as well. 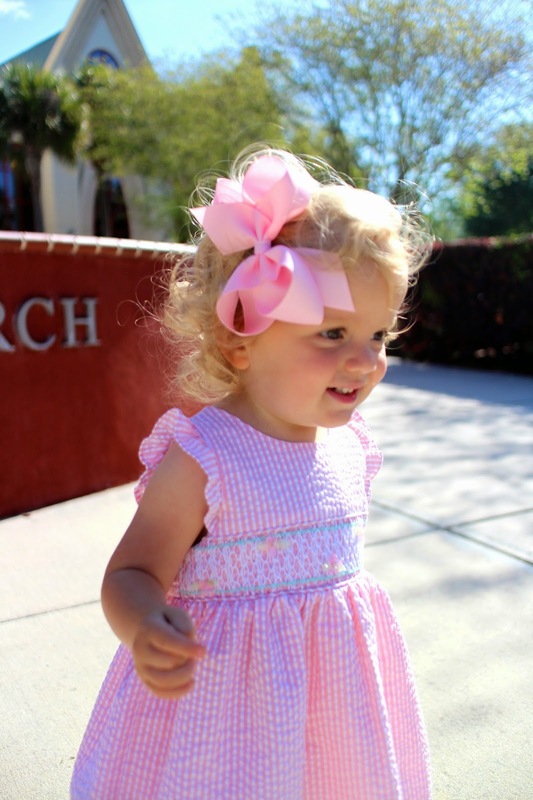 After service, we headed home to grab our Easter dishes and celebrated with an Easter brunch with some other families from church. 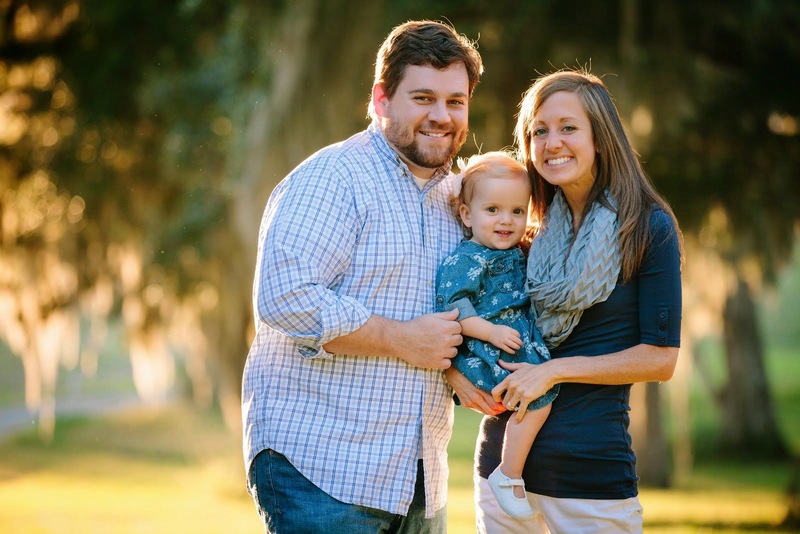 They are always so sweet to invite us to spend holidays with them since our families are far from Citrus County! 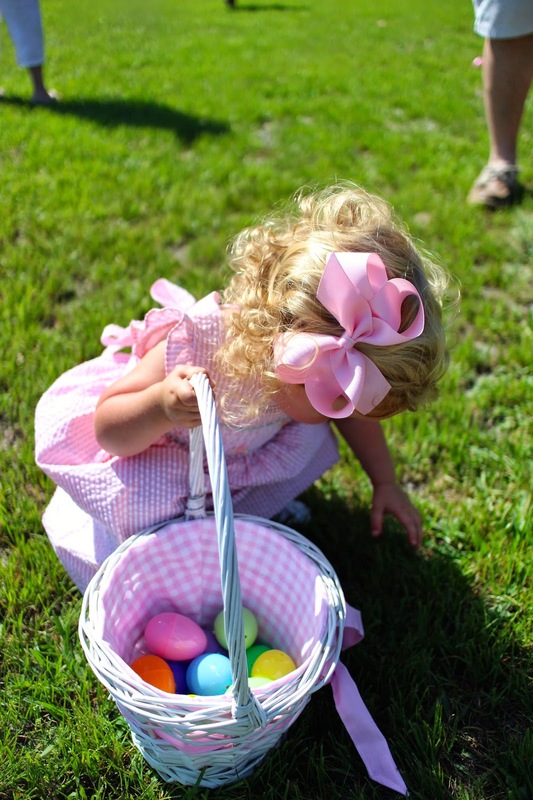 They even planned a fun egg hunt for the youngsters. 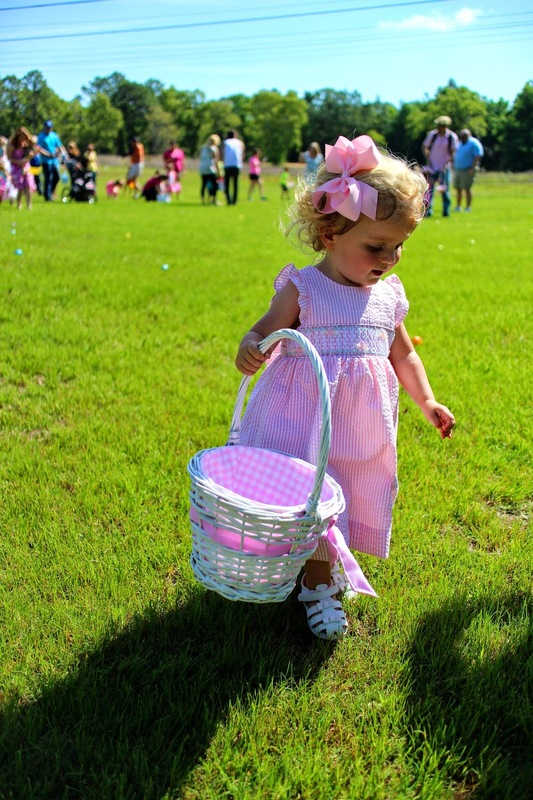 Hatley-Grace finally discovered the candy inside the eggs, and had her first jelly bean on this egg hunt. 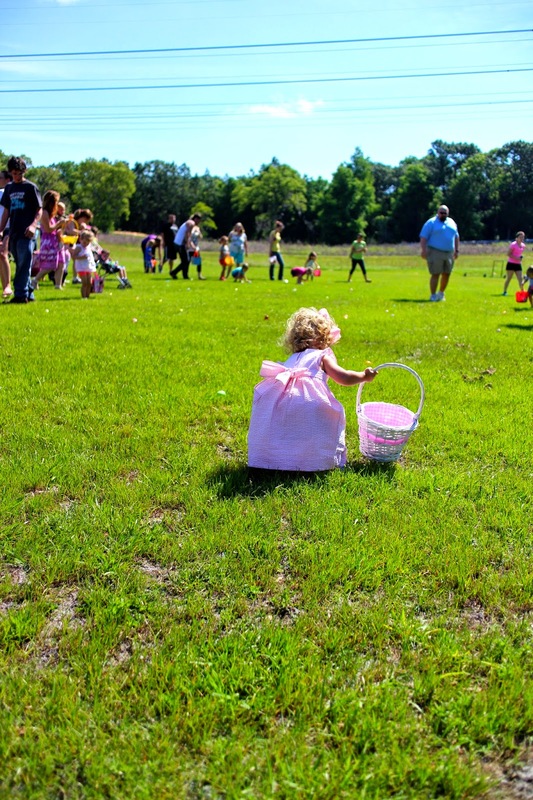 Seven Rivers, our church, has a huge egg hunt every year. It is such a fun morning, with lots of games and activities for the children, a big egg hunt that last for a few minutes, and lunch and fellowship. 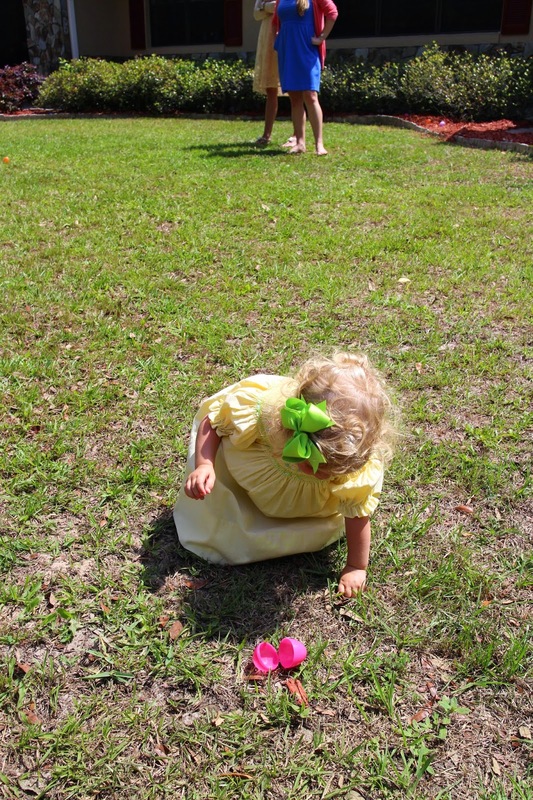 but this year, we practiced egg hunting and talked lots about finding eggs and putting them in the basket. She had a blast playing with her friends and hula hooping before the hunt. They divided the hunt up by ages, so she was on a field with just toddlers. She waited with her Daddy like such a big girl to start. 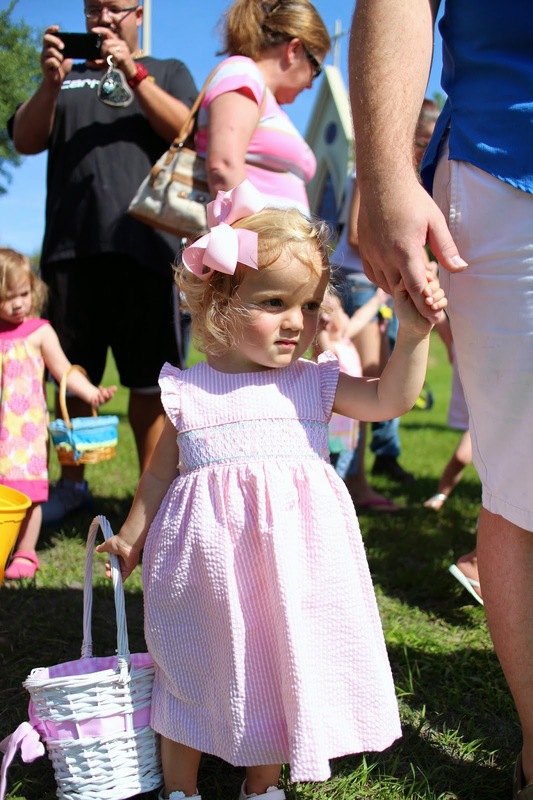 She was not the least bit shy about finding the eggs and putting them in her basket. Sweating from all the hard work! So proud of all her eggs!